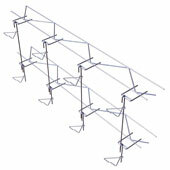 Ladder Type rubble (or ashlar) stone anchoring system for cavity or insulated walls. 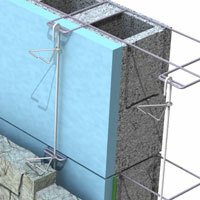 Rubble stone can then be tied easily to the backup using these flexible ties wherever the veneer mortar joint may lie. 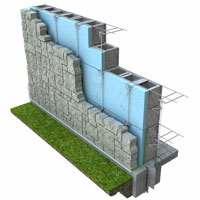 Ideal for when horizontal mortar joints do not align, and a large amount of vertical adjustability is required. 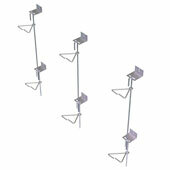 Backup Ladder available with any combination of 9 ga. or 3/16" dia. 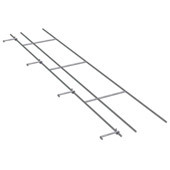 Side and Cross Rods. Vee Ties are standard 3/16" dia. x length to suit. System shown with insulation/cavity condition. 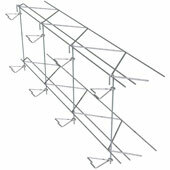 For other applications, see Tie-HVR-190 Anchor System (or TIE-HVR-195VB Anchor System) or contact an H & B Technical Representative.